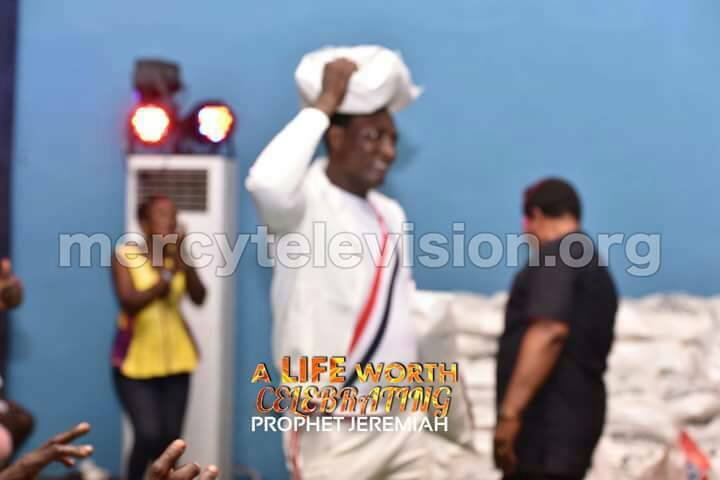 Home / Uncategories / Billionaire Prophet Jeremiah Omoto Fufeyin Celebrated 46th Birthday With Less Privileged, Showers Gifts Over N100Million. (Photos). 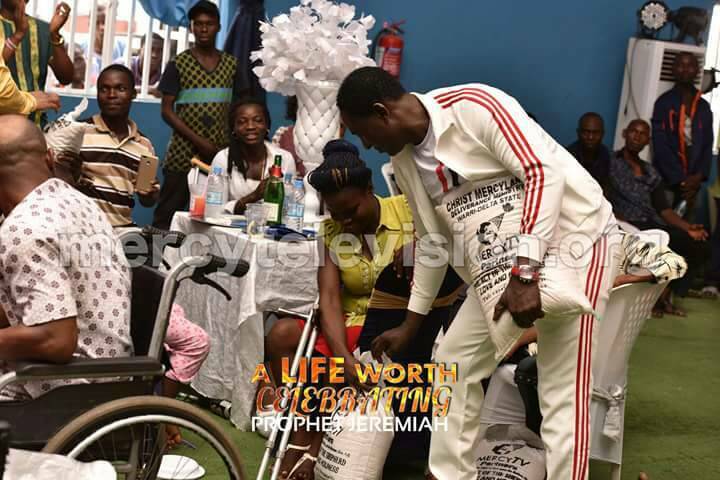 Billionaire Prophet Jeremiah Omoto Fufeyin Celebrated 46th Birthday With Less Privileged, Showers Gifts Over N100Million. (Photos). There were lots of fun and excitement embellished with love from a Heart of Gold on Thursday, February 16 at Christ Mercyland Deliverance Ministry, Warri, Delta State, as Prophet Jeremiah Omoto Fufeyin left thousands of less privilged with a lasting smile during the celebration of his 46th birthday. 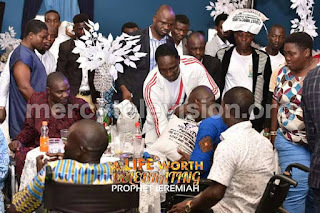 The epoch making event kicked off when the Billionaire pastor, also called The Tireless General, clad in designers sport wear, stepped out to party hundreds of people that thronged the expansive compound that is regularly experiencing positive changes with modern infrastructure. 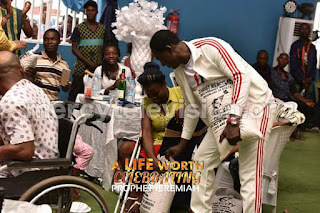 The miracle man of God known for his generosity did not disappoinfeted the less priviledged which comprises the physically challenged, helpless old folks, orphans, and children taken from the streets. 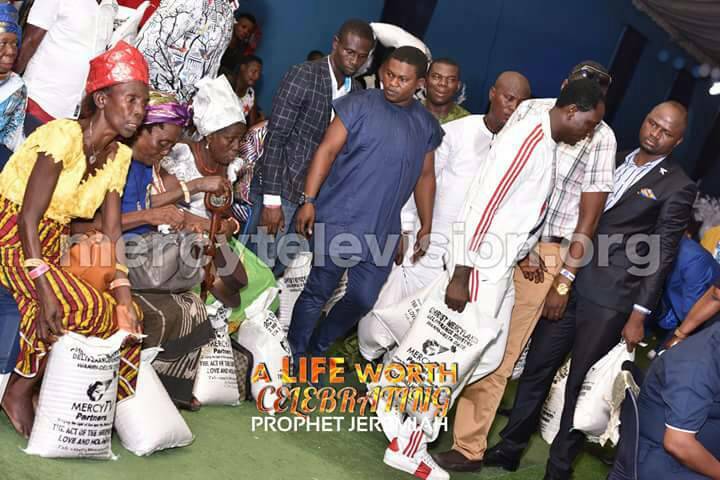 He did not only personally serve them with food, drinks and cakes but also shared the sum of a whopping N25m amongst them even they smiled home with food items like rice, Indomie noodles, toiletries, among others. The excited cleric who made the event exciting by interacting with them, made them understand that they are not alone. While encouraging them, he said: “God is our father. The one day celebration which was in three parts witnessed a lot of activities of entertainment such as comedy, music, dance and acrobatics. The Master of Ceremonies, Young Sheep, gave a good account of himself as well as other entertainers like Onigbese, Kelvin Sapp, Freeman (a cripple)The Trinity, among others, who spiced up the occasion with their different talent and skills. Present at the glamorous event were the likes of top Nollywood stars such as Mr. John Okafor (Mr. Ibu) who supervised the cutting of the first set of cakes, National President of Actors Guild of Nigeria, Mr. Emeka Rollas, Mr. Steve Eboh, Miss Oma Elom, Mr. Remmy Ohajianyan, among many others. It was indeed a life worth celebrating!